Led by their captain, Jean-Luc Picard, the new crew set out on their voyage in a new starship, venturing further into the unknown than ever before! 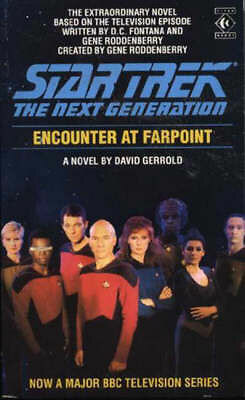 The novelization of the pilot episode of Star Trek: The Next Generation reveals a fascinating insight into some of the early plans for the characters, and adds a little to the story as seen on TV. For the most part, it is an accurate representation of what happened on screen, though several segments are different from those shown, presumably because Gerrold was working from an earlier draft of the script. Riker's first encounter with Data is different and sheds a different light on their relationship that never gets explored in quite the same way, and there are hints of things for other characters do come to pass despite being missing from the finished episode. Some of the characters' backgrounds are given in more detail than the show, and it's interesting where these diverge from the TV series - whether by Gerrold adding colour or the series 'bible' be rewritten later by the series' writing staff. Data's origin stands out, along with aspects of Picard's history that go unexplored on TV. A good read, and for the most part a faithful representation of the original episode, although having to rely on the script for the structure does make some elements feel a little clunky.